This year at Adopt-A-Dog’s Puttin’ on the Dog festival and adoption event, the police dog demonstration featured several officers and their canine working companions. The working teams represented Greenwich and Stamford Police Departments, the Metropolitan Transportation Authority and the Department of Corrections. Sgt. Thorme of the Greenwich Police Dept pointed out the that dogs, both German Shepherds and Labradors, are trained for obedience, and often cross trained for more than one purposes. Tasks include detecting narcotics or incendiary devices, evidence recovery and handler protection. During the demonstration, the yellow lab detected drugs on one of a half dozen people participating in the exercise. The dog also sniffed narcotics hidden in a police car. During another demonstration, which simulated “handler protection” with a “bad guy.” The police officer shouted for the suspect, who was running away, to stop. The dog did exactly what the officer instructed him to do. He went after the arm of the suspect and let go only when the officer instructed him to. “Connecticut state law says we have to announce our intentions that say we have to give you a chance to give up,” Thorme said as officer in the demonstration called out to the officer pretending to be the bad guy to stop. Officer Keith Scorco and his police dog Canine Kato are on call 24 hours a week, according to Sgt. Thorme who said the dog goes home with Officer Scorco every day after work. 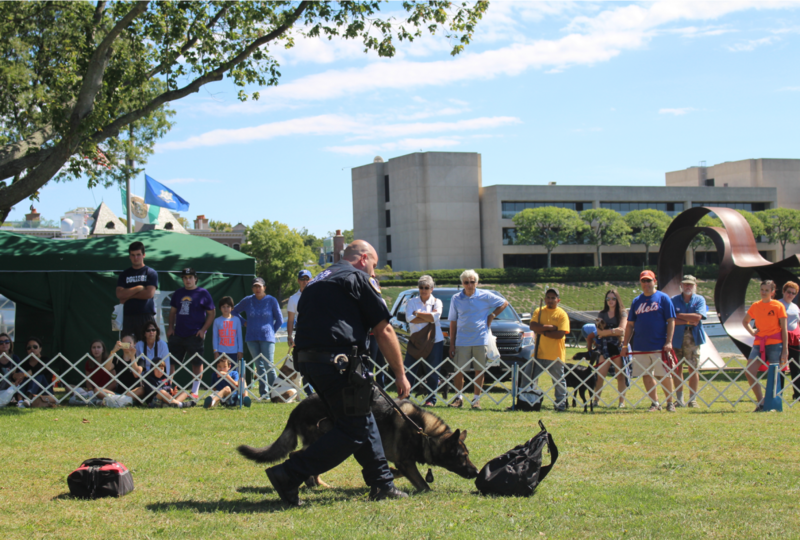 The K9 demo was part of the daylong event, held at Roger Sherman Baldwin Park. Puttin on the Dog is major annual fundraiser for Adopt-A-Dog, which recently waived their adoption fees in lieu of an optional donation. Their number of adoptions has soared. And while last year no dogs were adopted from Adopt-A-Dog at the event, at the outset of the event there was one pending adoption as well as a second adoption at the kick off event at Little Pub. When the finally tally of adoptions is announced, Greenwich Free Press will share that information! ...The ReDesigned SAT Portends AWFUL Results for Students in Bad Urban Schools.